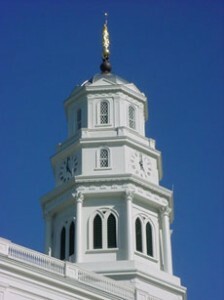 The rebuilt Nauvoo Temple. Photo by Kenneth Mays. After the extermination order was issued by Missouri Governor Lilburn W. Boggs, the Latter-day Saints were forced from their Missouri homes in the winter of 1838-39. After spending the remainder of the winter in Quincy, the Saints settled on the bank of the Mississippi in Commerce, Illinois. 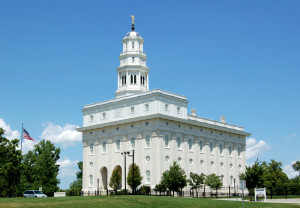 After Nauvoo began to be constructed, the Lord again commanded the Saints to begin building a temple in January 1841.2 Daniel H. Wells, who at the time was not a church member, donated the site on which the temple originally stood.3 Wells later joined the Church and became a counselor to President Brigham Young in the First Presidency. 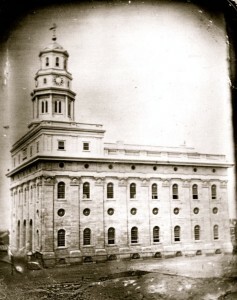 Original Nauvoo Temple. Photo from LDSCA. 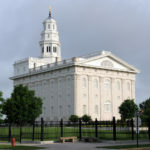 The temple was built through the tithes of time and money of the members.5 The building of the temple inspired some of the women in Nauvoo to organize a society to help support its construction. The organization was officially formed as the Relief Society in March 1842. – The Lord commanded the Saints to build a temple in January 1841. – Baptisms for the dead were first performed in the basement in the baptismal font on November 20, 1841. 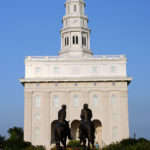 – The Nauvoo Temple was originally dedicated in May 1846. – The temple was rebuilt in 2002 and dedicated by President Gordon B. Hinckley on June 27, 2002. After the martyrdom of the Prophet Joseph Smith and his brother Hyrum, the Saints worked to complete the temple before they were forced to flee to the Rocky Mountains. On November 30, 1845, the attic of the temple was sufficiently completed to allow that portion to be dedicated and endowments were given in that area of the temple throughout the winter of 1845-46.8 The entire temple was dedicated privately by Joseph Young on April 30, 1846, and publicly by Orson Hyde the following day.9 However, most of the Saints living in Nauvoo had gone west by this time. The temple was the target of arson on October 9, 1948, the fire allegedly being started by Joseph B. Agnew. Afterwards, a tornado came through Nauvoo and knocked down one of the walls. 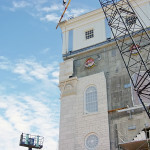 The remaining walls were dismantled for safety reasons and the stones were used to construct other buildings in Nauvoo. 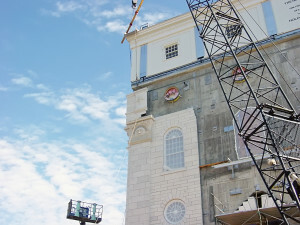 The Nauvoo Temple under construction. Photo by Kenneth Mays. In closing now, I feel impressed to announce that among all of the temples we are constructing, we plan to rebuild the Nauvoo Temple. A member of the Church and his family have provided a very substantial contribution to make this possible. We are grateful to them. 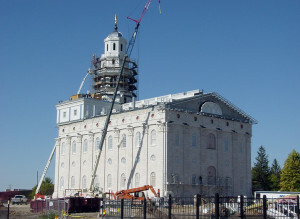 The reconstructed temple was dedicated on June 27, 2002. Hours of Operation: Click here for the current temple schedule. The Nauvoo Temple is an operating temple of The Church of Jesus Christ of Latter-day Saints. Admission is not open to the general public and for Church members an ecclesiastical endorsement is required. All may walk the grounds during daylight hours. 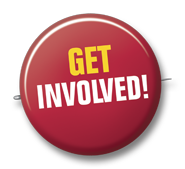 Recommend holders who wish to attend the temple may call ahead for schedules and other information at 217-453-6252. The Nauvoo Temple as construction was nearing an end. Photo by Kenneth Mays. Nauvoo Temple. Photo by Kenneth Mays. 1 Joseph Smith, History of The Church of Jesus Christ of Latter-day Saints, 7 vols., introduction and notes by B. H. Roberts (Salt Lake City: The Church of Jesus Christ of Latter-day Saints, 1932-1951), 3: 375. 2 Doctrine & Covenants 124:31. 3 E. Cecil McGavin, The Nauvoo Temple, (Salt Lake City: Deseret Book Co., 1962), 104. 4 Doctrine & Covenants 124:26-27. 5 Minutes of Lyma Conference., Times and Seasons, (November 15, 1841), 591. 6 Joseph Smith, History of The Church of Jesus Christ of Latter-day Saints, 7 vols., introduction and notes by B. H. Roberts (Salt Lake City: The Church of Jesus Christ of Latter-day Saints, 1932-1951), 4: 446, 454. 8 Andrew Jenson, Conference Report, (October 1923), 129 – 130. 10 Gordon B. Hinckley, “Thanks to the Lord for His Blessings,” Ensign, (May 1999), 88. Almighty God, we come unto Thee in solemn and reverent prayer in the name of Thy Beloved Son, our Redeemer, even the Lord Jesus Christ…. “The Burning of the Nauvoo Temple,” Millennial Star, 1895. “President Hinckley and the Nauvoo Temple,” Ensign, July 2002, 24. Joseph Earl Arrington, “Panorama Paintings in the 1840s of the Mormon Temple in Nauvoo,” BYU Studies, 1982. Joseph Earl Arrington, “William Weeks, Architect of the Nauvoo Temple,” BYU Studies, 1979. Lisle G. Brown, “The Sacred Departments for Temple Work in Nauvoo,” BYU Studies, 1979. 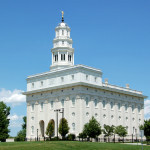 Don F. Colvin, “Nauvoo Temple,” Encyclopedia of Mormonism, ed. Daniel H. Ludlow et al., 1992. Richard O. Cowan, “The Pivotal Temple,” Regional Studies in Latter-day Saint Church History: Illinios, ed. H. D. Garrett, 1995. Richard N. Holzapfel and J. B. Holzapfel, Women in Nauvoo, 1992. Stanley B. Kimball, “The Nauvoo Temple,” Improvement Era, 1963. Matthew S. McBride, “The First Nauvoo Temple: So Great a Cause,” Ensign, July 2002, 8. E. Cecil McGavin, Nauvoo the Beautiful, 1946. 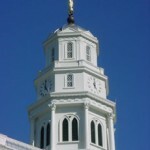 Ann Whiting Orton, “The Nauvoo Temple: Cornerstones of Faith,” New Era, May 2002, 20. 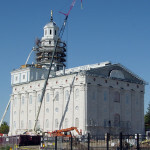 Don L. Searle, “Nauvoo: A Temple Reborn,” Ensign, July 2002, 15.